The major companies in global wood adhesives and binders market comprise Ashland Inc., 3M Company, BASF SE, Henkel AG & Co. KGaA, Avery Dennison Corporation, H.B Fuller Company, Huntsman Corporation, Adhesives Research Inc., Bostik SA, and Dow Chemical Company. These players are claimed to have major role in the development of wood adhesives and binders market. According to analysts at Zion Market Research, the global wood adhesives and binders market added up for USD 14.88 Billion in 2016 and is likely to cross USD 18.99 Billion by end of 2022, developing at a CAGR of almost 4.2% from 2017 to 2022. As per analysts at Zion Market Research, the global wood adhesives and binders market is likely to see significant development due to rising construction activities all over the world over the forecast period. Wood adhesives and binders indicate to a substance employed for holding together two wood surfaces or another element. The developing construction sector and the widespread infrastructure activities are likely to boost the growth of wood adhesives and binders market in the near future. Moreover, altering trends in lifestyle and home furnishings is also likely to power the development of the wood adhesives and binders market. On the other hand, increasing rules on the usage and manufacturing of wood adhesives and binders and the changeable prices of raw material are claimed to be the limitations to the development of the wood adhesives and binders market within the near future. The shift in the trend towards bio-based and green adhesives is likely to offer new avenues for the major players in the sector to drive the wood adhesives and binders market. Also, various R&D activities by market players in the industry are also set to bolster the development of wood adhesives and binders market. For example, in January 2016, BASF strengthened its business by combining development and marketing of adhesive systems, which depend on amino isocyanates and resins, boosting the development of wood adhesives and binders market. In terms of topography, North America in 2016 was the biggest market for wood adhesives and binders market owing to the huge construction sector and the development activities for infrastructure in the area. Asia Pacific added up for the second biggest share chased by Europe. Asia Pacific is likely to be the quickest developing region for the wood adhesives and binders market due to the increasing remodeling and construction activities in the area. 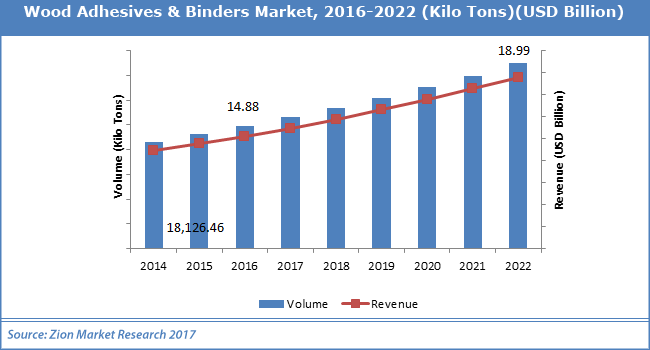 The Middle East & Africa and Latin America are likely to see reasonable development for wood adhesives and binders market within the forecast period.